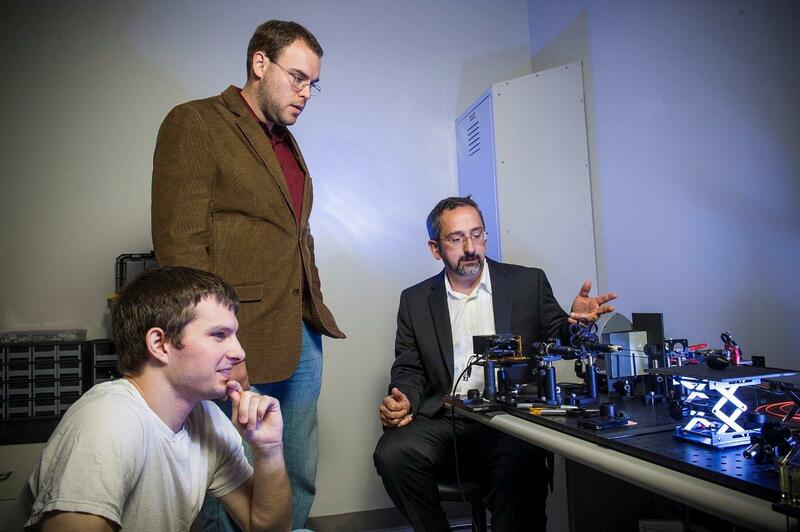 Developing a revolutionary technology to detect and treat cancerous tumors in the intraperitoneal cavity and other internal cavities such as oral and gastrointestinal is the goal of a research project being led by Wright State University physicist Ulas Sunar. Sunar is an Ohio Research Scholar for Medical Imaging, new director of the Biomedical Imaging Laboratory and associate professor in the College of Engineering and Computer Science’s Department of Biomedical, Industrial and Human Factors Engineering and the College of Science and Mathematics. In the Biomedical Imaging Lab in the new Neuroscience Engineering Collaboration Building, Sunar and his research team are building a new kind of flexible, fiber-based endoscope that is to be inserted into a body cavity or organ. It is a part of a two-year, $412,093 grant from the National Institute of Biomedical Imaging and Bioengineering division of the National Institutes of Health. Sunar plans to increase the sensitivity of the endoscope by adding a quantitative fluorescent imaging component, which can better detect lesions on the surface of internal organs. Blood and tissue tends to absorb conventional light and diminish the fluorescence imaging contrast. But the new fluorescent endoscope would correct for that, resulting in an improved contrast so that clinicians can better delineate cancer from surrounding normal tissue. There is a therapy component to the approach, Sunar says. Surgeons often destroy cancer cells using a fixed laser beam pattern, but lesions usually have irregular shapes. A novel chemo-drug is being developed by researchers at the University of Buffalo in which a cancer-killing drug in nanoparticles encapsulated by liposomes is injected into the patient and is then activated by the endoscope Sunar is developing. Once Sunar and his research team complete the endoscope, they will begin testing it on an animal model. He said the NIH grant has the potential to be extended to up to five years that would include clinical studies.